I’ve written at some point i’m sure about the joy of picking blackberries from the vines that line the bed of Santa Rosa Creek a couple of blocks from Gloria’s house, and about how much fun i’ve had gathering walnuts that fall into a park near her house from trees in back yards abutting it. Are these the best berries and walnuts i ever ate? No. But they’re quite good enough, and their flavor is enhanced by their being free. Similarly, when i’ve been visiting my friend Bob in Palm Springs i’ve picked grapefruit from the old trees in his condo complex, and yes, i’ve had better but at least these are the old Marsh variety that was bred for flavor rather than sweetness. Early this summer Carol had taken me out to eat at this tasty Nepalese restaurant out in the avenues, and on the way home i showed her the Seward Slides. The previous link there will tell you the history. Here’s the reality today. Read a few of the reviews to get an earful about the wicked witch who now guards the slides. Perhaps after hearing people enjoy themselves on a warm, sunny afternoon has caused her to die of apoplexy, the city won’t need to chain the slides up at night. But i digress. When i got Carol to the little park we noticed on the ground at the lower entrance what looked at first like Rainier cherries, but which closer examination revealed to be tart little yellow plums…and not bad ones at all. And how do i know that? Well, one of the supreme guy pleasures is being out on a walk with a lady friend, spotting something on the ground, picking it up, sniffing it, wiping it off on your shirttail, and popping it into your mouth before she can slap it outta yer hand. The wiping is optional. The tree was laden with them, but all those on accessible branches had been picked. Next year i’m gonna find myself an athletic young person and bribe him/her into climbing that tree and filling a bucket for me so i can make some only-in-san-francisco preserves. But my most entertaining urban bounty find came to my attention only yesterday. I was chaining the Segway to the bike rack beside the right hand doors to the Market Street Safeway when my eye alit on something sitting on the ledge of the concrete planter beside the rack where i’d been chaining the Segway for years. Looks like a feijoa, i thought, and when i picked it up i realized that’s exactly what it was. 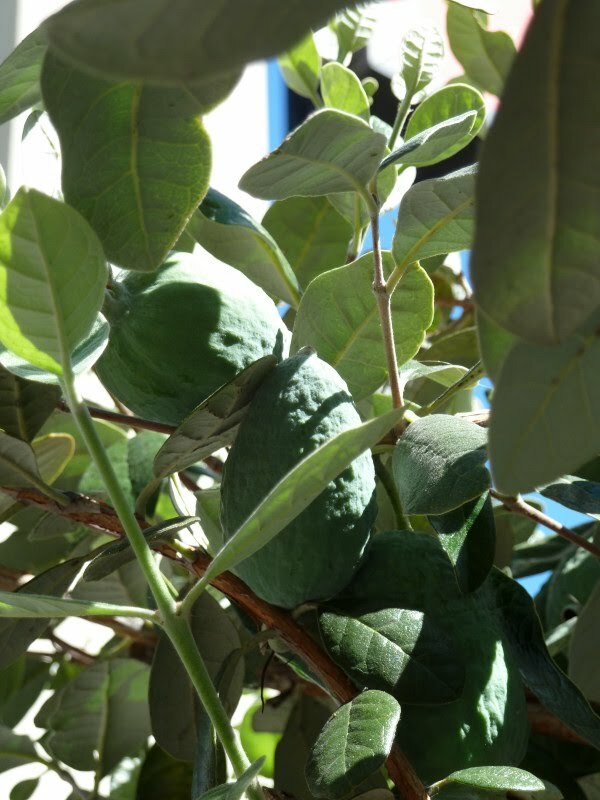 I wondered only briefly why someone would leave a single feijoa resting on the ledge before my eyes rose to the bush in the planter and i noticed that someone had apparently stuck a bunch of feijoas up into the bush. At least i didn’t wait to notice them until one fell and hit me on the head. I figure maybe the homeless snack on them as they ripen, but in any case there were not all that many on the bush, so i picked only three more to include in a mixed fruit jam i’m making, mainly to be able to add “feijoas” to the list of ingredients.